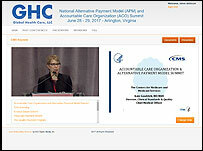 WASHINGTON DC USA -- MARCH 21, 2019: The Tenth National Accountable Care Organization (ACO) Summit, www.ACOSummit.com, will be held on June 17 - 19, 2019 at the Grand Hyatt in Washington, DC. ACO Summit X will be collocated with MACRA Summit IV and Bundled Payment Summit IX, and the three events will share several joint plenary sessions. Registrants may attend the event in person or online (live webcast and archived for 6 months). FEATURED SESSION: WHAT'S NEXT FOR NEXT GEN ACOs? For sponsorship and exhibit information, visit www.ACOSummit.com/promotional-opportunities/, or contact Justin Sorensen, Exhibit Manager, at (206) 452-0609 phone, (206) 319-5303 fax, or exhibits@hcconferences.com. For Summit registration information, visit www.ACOSummit.com/registration/, email registration@hcconferences.com, or call 800-503-3597.